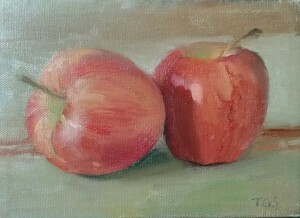 A quick oil painting of two apples. The canvas is 7″ x 5″. Inspired by Duane Keiser,the “painting a day” dude. Getting the highlight and striped texture is a real challenge on this one.